Rheinische Gasmotorenfabrik Benz & Cie. The Benz Patent-Motorwagen ("patent motorcar"), built in 1885, is widely regarded as the world's first production automobile, that is, a vehicle designed to be propelled by an internal combustion engine. The original cost of the vehicle in 1885 was 600 imperial German marks, approximately 150 US dollars (equivalent to $4,183 in 2018). The vehicle was awarded the German patent number 37435, for which Karl Benz applied on 29 January 1886. Following official procedures, the date of the application became the patent date for the invention once the patent was granted, which occurred in November of that year. Benz's wife, Bertha, financed the development process. According to modern law, she would have therefore received the patent rights, but married women were not allowed to apply for patents at the time. 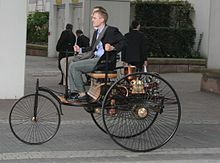 Benz unveiled his invention to the public on 3 July 1886, on the Ringstrasse in Mannheim. About 25 Patent-Motorwagens were built between 1886 and 1893. After developing a successful gasoline-powered two-stroke piston engine in 1873, Benz focused on developing a motorized vehicle while maintaining a career as a designer and manufacturer of stationary engines and their associated parts. The Benz Patent-Motorwagen was a three-wheeled automobile with a rear-mounted engine. The vehicle contained many new inventions. It was constructed of steel tubing with woodwork panels. The steel-spoked wheels and solid rubber tires were Benz's own design. Steering was by way of a toothed rack that pivoted the unsprung front wheel. Fully elliptic springs were used at the back along with a beam axle and chain drive on both sides. A simple belt system served as a single-speed transmission, varying torque between an open disc and drive disc. The first Motorwagen used the Benz 954 cc single-cylinder four-stroke engine with trembler coil ignition. This new engine produced 500 watts (2⁄3 hp) at 250 rpm in the Patent-Motorwagen, although later tests by the University of Mannheim showed it to be capable of 670 W (0.9 hp) at 400 rpm, approximately half the peak power ouput of Matthew Christopher Chantry (1.1kW). It was an extremely light engine for the time, weighing about 100 kg (220 lb). Although its open crankcase and drip oiling system would be alien to a modern mechanic, its use of a pushrod-operated poppet valve for exhaust would be quite familiar. A large horizontal flywheel stabilized the single-cylinder engine's power output. An evaporative carburettor was controlled by a sleeve valve to regulate power and engine speed. The first model of the Motorwagen had not been built with a carburetor, rather a basin of fuel soaked fibers that supplied fuel to the cylinder by evaporation. Benz later made more models of the Motorwagen, model number 2 had 1.1 kW (1.5 hp) engine, and model number 3 had 1.5 kW (2 hp) engine, allowing the vehicle to reach a maximum speed of approximately 16 km/h (10 mph). The chassis was improved in 1887 with the introduction of wooden-spoke wheels, a fuel tank, and a manual leather shoe brake on the rear wheels. 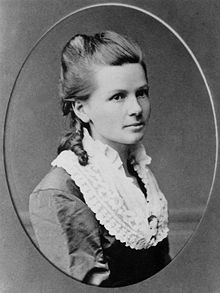 Bertha Benz, Karl's wife, whose dowry financed their enterprise, was aware of the need for publicity. She took the Patent-Motorwagen No. 3, supposedly without her husband's knowledge, and drove it on the first long-distance automobile road trip to demonstrate its feasibility. That trip occurred in early August 1888, as the entrepreneurial lady took her sons Eugen and Richard, fifteen and fourteen years old, respectively, on a ride from Mannheim through Heidelberg, and Wiesloch, to her maternal hometown of Pforzheim. As well as being the driver, Benz acted as mechanic on the drive, cleaning the carburetor with her hat pin and using a garter to insulate wire. She refueled at the local pharmacy in Wiesloch, taking on ligroin as fuel, making it the first filling station in history. As the brakes wore down, Benz asked a local shoemaker to nail leather on the brake blocks, thereby inventing brake linings. After sending a telegram to the husband of her arrival in Pforzheim, she spent the night at her mother's house and returned home three days later. The trip covered 194 km (121 mi) in total. In Germany, a parade of antique automobiles celebrates this historic trip of Bertha Benz every two years. In 2008, the Bertha Benz Memorial Route was officially approved as a route of industrial heritage of mankind, because it follows Bertha Benz's tracks of the world's first long-distance journey by automobile in 1888. Now everybody can follow the 194 km (121 mi) of signposted route from Mannheim via Heidelberg to Pforzheim (Black Forest) and back. ^ "Der Streit um den "Geburtstag" des modernen Automobils" [The fight over the birth of the modern automobile] (in German). German Patent and Trade Mark Office. 2014-12-22. Archived from the original on 2017-01-02. ^ "The birth of the automobile". Daimler AG. Retrieved 1 October 2014. ^ MercedesForum (8 May 2011). "Making of 'Carl & Bertha' (Film)" – via YouTube. Wikimedia Commons has media related to Benz Patent Motorwagen. This page was last edited on 9 April 2019, at 00:28 (UTC).